Tina is a graduate of SGT’s Protégé Program (class of 2015). Her recent Chicago credits include: Octagon (Jackalope Theatre), Martyr (Steep Theatre), The Tragedy of Lear (Cave Painting Theatre), and Gift Horse Grill (Step Up Productions’ Holidaze). 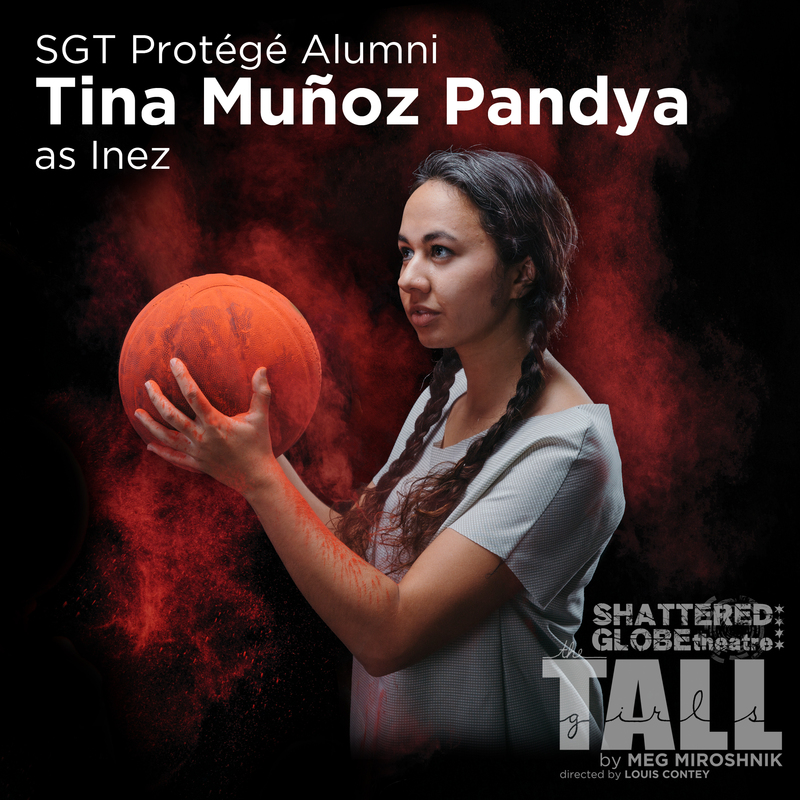 She plays Inez in SGT’s production of The Tall Girls by Meg Miroshnik. We asked her some questions about her experience with sports and her thoughts on the relevance of this production. I played for maybe 2 years in middle school just for fun. I never had any formal or structured training, but I did enjoy pickup games and I had a hoop in my backyard that I loved to mess around on. My main sport was volleyball, I played for 8 years growing up so most of my sports energy went towards that. I still see volleyball habits come out when I play other sports, sometimes I have to consciously remind myself not to hold the basketball like I’m setting it! I definitely understand more of the game, which makes it much easier to be interested when I’m watching people play! Oh my goodness yes. I’m lucky because my character doesn’t have to have any talent so I can kind of get away with not being great at it, but allowing for contingencies in the story based on what happens when we play definitely keeps us on our toes. What are some of the most interesting things you learned as a result of doing this play? About girls’ empowerment? We talked a bit in early rehearsals about how, when Shattered Globe was choosing this play, they expected it to be a celebration of women on the heels of this country electing their first female president. It has turned into something quite different, and now it feels more like a call-to-action and a reminder that we still have so much work to do. The women in this play spend much of their journeys becoming empowered and hopeful that a world of possibilities will be open to them, only to have the rug ripped out from under them when they are so close to triumph they can practically smell it. I feel like this country went through a similar journey in November, and I feel like the different ways in which these characters handle their defeat says a lot about the ways in which we can begin to heal as a country. Every show is a different adventure and it’s been so lovely working with this awesome cast and crew on a play that centers around the experiences of women. I don’t remember when I last did a show with a mostly-female cast, and it’s been a really great energy to be around. Especially given our current social and political climate, I think it’s so important to amplify marginalized voices in the work we do as artists, and navigating that as we’ve worked on this show has been very cool. Working on this play has also re-kindled my taste for competitive sports; some of our basketball practices took me right back to my volleyball days and made me miss competing and training a little bit, so I’m interested to see how that continues to grow.